Wimal Nanayakkara is a Senior Visiting Fellow of the IPS with research interests in poverty, and is a specialist in Sampling. He was previously engaged at the Department of Census and Statistics, where he functioned as the Director General for 12 years. 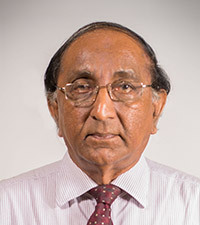 Wimal received his BSc in Mathematics and Physics from the University of Peradeniya and holds a Postgraduate Diploma in Applied Statistics from the University of Reading, UK.